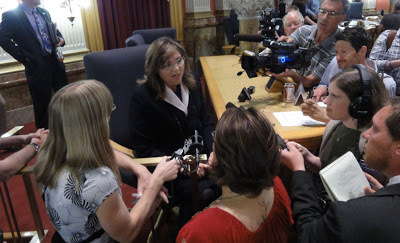 Civil Unions Advance In Colorado House After GOP Member Changes Her Vote - Joe.My.God. After some typically brutal and repulsive anti-gay testimony, last night Colorado’s civil unions bill advanced out of the state House Judiciary Committee by a one vote margin, surprising many observers. The winning margin was provided by the bill’s former opponent, GOP Rep. BJ Nikkel, seen above being swarmed by reporters after the vote. The measure faces two more committee votes, but sponsors are optimistic they have enough support to get the legislation within a week to Gov. John Hickenlooper, who is firmly behind the plan. The measure has already passed the Senate. The newfound support means Colorado could become the latest of more than a dozen states to provide such protection. Gay couples and their straight allies who waited into the night for the vote were initially hushed after the 6-5 vote. But moments later burst into tears and hugged one another, milling around the committee room long after the vote was taken. “My hope just shot through the roof. I feel like I’m sitting in the middle of an amazing place in history,” said Cristina Aguilar, a gay-rights activist from Denver. Rep. Mark Ferrandino, the Democrats’ leader in the House and a gay lawmaker who sponsored the bill, said before the vote that he and other people just want equal rights. He noted the law books behind the Republican chairman overseeing the House Judiciary Committee’s hearing. “All we’re asking is for equal access to those books that are behind you, Mr. Chairman,” Ferrandino said.